I couldn't resist taking more photos of my lavender centerpiece. I took the lavender into the house and set the arrangement on my small table in the dining room with one of my Lavender tea cups and saucer. Check out the centerpiece for my 'Summer Lavender Tea' here. This cup and saucer is part of a set I found at an antique store. 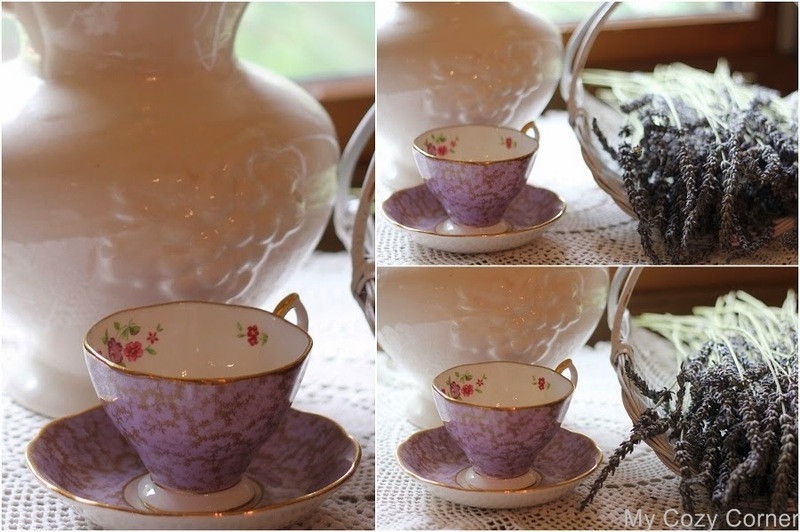 'Lavender' Archive Collectable Teas, Royal Albert, Bone China. The tea cup and saucer post is one of the top ten most favorite posts of all time. The post featuring the complete set is here. The fresh lavender is so wispy and feathery in the vintage white pitcher. Your lavender is so lovely, and your selection for the tea cup is just perfect. Come visit my 4th of July blog, Pam. 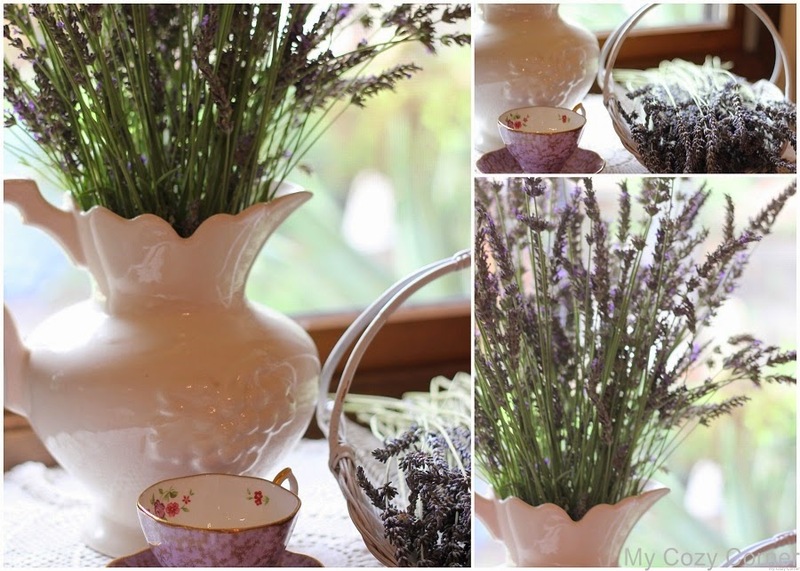 The lavender and the tea cup and pitcher all go so well together. A lovely tea. Oh, Betty, your lavender teacup is gorgeous! You have a lovely table and I can almost smell the lavender. A very pretty setting! Thank you for sharing and joining me for tea. Happy 4th of July! The vase of lavender must smell heavenly, and I like the teacup you chose to match the theme. Do you have a good recipe for lavendar lemonade? I restaurant here used to make it and it was delicious but they closed! Wahhhh!!! That is a beautiful cup! Thank you for linking with Home Sweet Home! Lovely post! I love Lavender! Thanks for sharing with SYC.